I can’t believe how good this recipe turned out. It’s simple and delicious. I served this for supper last night, and incredibly, the kids ate all their vegetables! Use fresh Parmesan cheese for the last-step sprinkle. 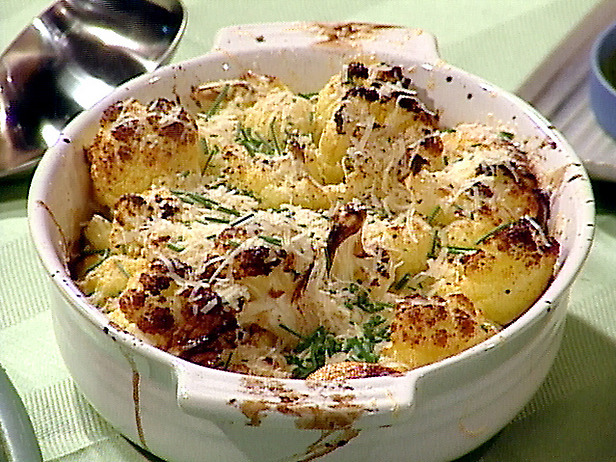 Place the cauliflower florets in a large saute pan or a roasting pan. Drizzle the olive oil over the cauliflower, and season with the garlic, lemon juice, salt and pepper. Place the saute/roasting pan in the oven and cook for 15 minutes, stirring occasionally to ensure even roasting. Remove from the oven and sprinkle with the Parmesan. Garnish with chopped chives and serve immediately while still warm.